A wonderful thing happened to me yesterday. I got stung by a honey bee! Why is being stung by a bee a such wonderful thing? Because I didn't have any kind of reaction to it whatsoever. Apparently I'm not as allergic to their stings as I feared. After being rushed to the hospital over the summer with a severe allergic reaction to multiple stings now I'm finding that I just might be okay taking a single sting once in a while. That really makes me feel better about working in my hives. I had a pretty exciting day at the bee hives on Sunday. My wife has always been on board with the bees, but this time she wanted to dive in with me and learn more about the inner workings of the hive. I am not an expert by any means, but I was anxious to show her what I knew. I have two bee suits so we both got dressed. I hate wearing that thing, but after the allergic reaction a few weeks back I have come to accept the fact that I need to wear it. We have no idea if my wife is allergic, but she has no desire to find out. In fact, she went so far as to wear rubber boots with her suit so that there was no chance of one getting her on the ankle. With the suits on and the smoker in hand we headed out to the hive. Both of my parents tagged along to watch as well. I have extra veils so they both put one on. The first hive that we went into was the one that I was working in when I got stung and had the allergic reaction. I thought maybe I had done something wrong that day to rile them up, but after pulling the top off it was pretty apparent that this hive is a little on the "hot" side. They were dive bombing us from the get go. In fact, even though my mom and dad were standing back both of them ended up getting stung on the hand. Thankfully the suits did their job because neither Donna or I felt the wrath of the angry ladies. Despite the flurry of activity around us we inspected the hive and took it all the way to the bottom brood box. There was a lot of brood (both capped and uncapped) plenty of pollen stores and some honey. I wanted so desperately to show her the queen, but I just wasn't able to locate her. I was on the lookout for hive beetles, but didn't see any. I also did my best to look for the dreaded varroa mite, but didn't see any of those either. The bee club recommends that we dust the bees with powdered sugar this time of year to help with varroa mites, so we did that. We also placed some Better Beetle Blaster hive beetle traps in the hive. As I was placing the frames back in my wife was brushing away the bees so that I wouldn't smash any. Her concern over their welfare was touching. The second hive is at my brother's house so we drove over there. It is amazing how different the temperament is between the two hives. I honestly believe that I could have gone in without using the smoker. These girls were docile and didn't seem to mind that we were there at all. When I pulled out one of the frames something caught my wife's attention. Upon closer inspection we realized it was a bee that was just hatching. I held the frame in my hand and we watched with delight as she worked her way out of the cell. It took about ten minutes, but she finally pulled free. She was just a little bit lighter in color and she took a few minutes to catch her bearing, but it didn't take long for her to fit in. In fact, there was another bee that kept impatiently walking back and forth as the hatching was taking place. I jokingly told my wife that was the head worker bee telling her to hurry up because there was plenty of work to do. I was joking, but I can't help but wonder if there is a grain of truth there. Like the other hive this one seemed very healthy. I did see one hive beetle, but smashed it with the hive tool. I know if there is one there are probably more, but I didn't want to set up the Better Beetle Blaster in this hive because I'm planning to move it back to my house this week. The traps are filled with vegetable oil and I don't want to spill any when I move the hive and inadvertently kill some of the bees. Once I have them home I'll take care of putting the traps into this hive. All in all it was a successful afternoon working in the bee hives. The best thing about it is that I got to share it with my lovely bride. It can't get much better than that. This past Saturday was National Honey Bee Day and our club sponsored an all day event to celebrate. We had guest speakers, vendors, a kids area, an observation hive, an open hive demonstration, food and a fund raising auction. 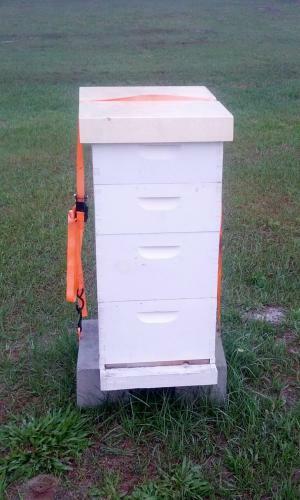 I'm happy to say that we raised 2000.00 that will go to the University of Florida for bee research. 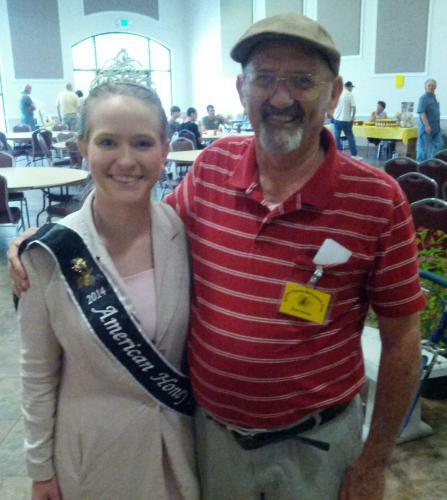 It was a fun day spent with fellow beekeepers and we got to talk to plenty of beekeeper wannabees (pun intended). Well, after having a little time to think about it I have decided that I enjoy the bees too much to give them up, despite the allergic reaction that I wrote about a couple of weeks back. I got my first opportunity to work in full gear yesterday. I split a hive earlier this year and moved one to my brother's house. Unfortunately, I lost a hive at my house, so I wanted to bring the hive from his house back to mine. After it got dark my youngest son and I headed over there to bring it back. Ever since I moved that hive they have wanted to hang out on the outside of the box. I didn't think it was going to be a big deal, but after I got there and started looking I realized that if I moved it I was going to lose a lot of bees simply because there were so many on the outside of the box. So, I'm going to go back and add another super. Hopefully that will encourage them to move back in so I can bring them home. Even at night time I was sweating like crazy in the full gear. I'm not looking forward to working under the hot, Florida sun with all of that on. HOW 'BOUT THEM BEES? That was the subject line on the e-mail that I was looking at this past Thursday afternoon. It came from the young man who was so interested in my garden just a month ago. He knew that there was a bee club meeting on Friday and wanted to know the time and place. I sent him the information and shortly thereafter got a reply that he couldn't make it. I haven't forgotten what it's like to have two small children and a pregnant wife, so I let him know that I completely understood. Little did I know that subject line would define my weekend. The meeting went well on Friday evening and I got a lot of good information so I decided to head into one of the hives on Sunday morning. I suited up like I normally do: long sleeve shirt, thin garden gloves (I have thicker gloves just for beekeepers, but find them bulky and restraining), hat, veil and shorts (it gets hot in Florida and I've never had an issue wearing shorts). With the smoker going I pulled off the top cover. As has been the case many times before the bees were calm and allowed me to work without being too upset about it. I checked out the top super without incident, pulled it off and set it aside. Then, I started pulling frames out of the brood box. Now, I must say that the weather was perfect. It was hot and there wasn't a cloud to be seen. Up until this point the bees had been quite accommodating. That's why I was totally surprised when I suddenly found that about six of the little critters had attached themselves to my right hand and were stinging me through the thin gloves. I've been stung before and I know not to panic when it happens, but the stings felt different this time, more painful if that's possible. I managed to calmly set the frame down and back away from the hive. I pulled the glove off and looked to see if I could find any of the stingers to scratch them out. My hand was visibly shaking at this point and it was quite painful. Not wanting to experience getting stung in the hands again I made my way to the shed to put on my other gloves. After putting on the thicker gloves I walked up to the hive and immediately got a sting on the back of my right leg. It was obvious that the bees were clearly agitated so I took the opportunity to close up the hive and leave them alone. I ended up with one more sting on my right ankle before it was over and, to be honest, I was glad it was over. I put all of my equipment away and headed inside. I had been sweating quite a bit so I told my wife that I was going to jump in the shower. It was while I was in the shower that I realized that something was definitely wrong. The first thing I noticed was that my lips were starting to go numb. Then, I noticed that my upper torso had broken out in small hives. I looked at my arms and noticed that they were also broken out, but instead of the blotchy looking hives that I had on my torso they were just red pinpoints that went up and down both arms. Needless to say, I rinsed off and got out of the shower. My wife knows that I am not a fan of going to the doctor, especially after the $1000.00 nose bleed that I recently posted about, so she immediately knew something was out of the ordinary when I rushed into the dining room wearing only a pair of shorts and told her that she needed to take me to the doctor right away. At this point my tongue had started to swell up and the words didn't come out quite right. After taking a look at the hives all over my body she jumped up and started looking for the car keys. I wouldn't say that I panicked, but I was definitely concerned at this point. I pushed away thoughts of my throat closing up and we both made a hasty trip to the car. Thankfully, there is a critical care clinic only five miles away from my house. By the time we got there I was swelling up everywhere. I was only stung on the right side of my body, but even my left side was feeling the effects. I couldn't get my wedding ring off, my lips were completely numb, my tongue was visibly swollen and it was red all around my nose and up between my eyes. Even the top of my bald head was starting to show signs of swelling and my scalp was itching me to death. The clinic took care of me and one shot of steroids seemed to calm everything down. Unfortunately, the doctor had to cut my wedding ring off. That really stinks. I've been wearing it for going on twenty-eight years now. My right hand swelled up so much that I could hardly use it most of the day, but other than that everything went back to normal pretty quickly. Now, only two days later, even my hand is back to normal. Now I'm assessing the situation and trying to learn from it. The biggest takeaway is that I will be wearing full gear the next time I go into the hive. I have a full suit, but have stayed away from it because it can be so hot. Considering the alternative I think I'll take heat over a near death experience. I can't explain why I never had a reaction before. I've been stung quite a few times while messing with the hives, although I've never gotten so many at once. Maybe it was because I got so many, or maybe because they were mostly concentrated in one location on my body. I just don't know. I also need to step back and ask myself if I want to move away from this hobby all together. I'm sure there are other beekeepers who have had a reaction to bee stings. Maybe this will never happen again. Or maybe it will. It could be that I can handle one or two stings and not have any reaction at all. But do I really want to take that chance? HOW 'BOUT THEM BEES? This one will take some thinking. I've been a little concerned that the hive I split a few months back wasn't doing well so after work yesterday I opened it up to have a look. I'm happy to say that there is honey, pollen, brood and even some new bees. I'm still going to keep an eye on it, but I think it is going to be OK. I also looked in on the hive that I didn't split. It is doing so well that I was able to snag one of the frames of honey. There is just something about eating honey right out of the hive. The honey that I got yesterday has a slight taste of loquat. When the loquat tree was in bloom you could stand underneath it and hear all of the bees overhead. The buzz was so loud that it almost sounded like a roar. It would have been pretty intimidating if I didn't know where the bees came from. I continue to learn more about the bees every day. They are such interesting creatures. I could sit in front of the hive and watch them go in and out for hours. I can't explain why they have me spellbound, but I can rest in the fact that I am not the only one. My wife, mom and dad are all equally attracted to our little friends. I've had a garden for many years, but this is the first year that I've actually had a bee hive sitting nearby. I would highly encourage others to check into getting a hive. Learn all that you can, join a local bee club, talk to other beekeepers, find a mentor if it is at all possible. There is so much to learn from the bees and so much to gain from having them around. It rained for two days straight this past week. When the sun finally came out yesterday I made my way to the garden to see what amazing things might have happened. 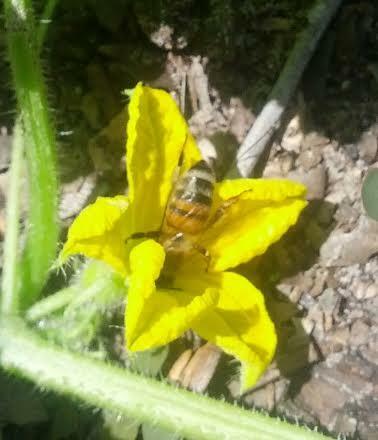 As I was passing by the cucumber plants I heard the unmistakable sound of a bee. It took me a few seconds, but I finally managed to find her. I thought it would make a good picture if I could catch her on one of the yellow blooms, so I whipped out my trusty phone and went to work. I'm sure anyone watching would have found it amusing as I crouched close to the ground, phone held close to the plant trying to follow the busy bee to as she buzzed from flower to flower. Every time I would try and take the picture she would fly away just before I could get her in focus. It took me a good five minutes, but I took a couple of good pictures. Now I have some more pictures that I can show off to unsuspecting non-gardeners. I can't wait. I didn't think I was going to get the opportunity yesterday, but I got to crack open the bee hives. My strong hive is doing well and has one full super of honey. Something must have happened to the queen though because I didn't find any capped brood. I did find some empty queen cells. I will check again in a couple of weeks. About two months ago I did my first walk away split with my other hive. I am excited to say that both hives are doing well. I kept one at my house and moved the other to my brother's house. The split was pretty easy and it increased my hives from two to three. I learned about walk away splits at one of the bee club meetings I attended. Since I am a beekeeping newbie attending the meetings has been very informative. I think three hives is about my limit. I thoroughly enjoy it, but I don't want to have more than I can manage properly.